How one chef's amazing dish earned him a painting from Damien Hirst. I learned a lot from my front-row seat for last night’s Grand Gelinaz! Shuffle, presented by San Pellegrino. As a reminder, for the #GelinazShuffle, 37 elite chefs set up shop at a restaurant kitchen in another part of the world; meanwhile another chef took over their place. I was lucky enough to have dinner at Manhattan’s Momofuku Ko, where the mad Italian genius Massimo Bottura, of Osteria Francescana, was serving dishes like Corn off the Cob in Textures and Temperatures (corn dashi, corn custard, dehydrated kernels) and Oops, I Broke the Cannolo as an Apple Pie. But Bottura served another, even more intriguingly named dish on his eight-course menu: “Beautiful Sonic Disco of Love and Hate at the Gate of Hell Painting with Wicked Pools of Glorious Color and Psychedelic Spin Painted Lamb, Not Flame Grilled.” It’s based on a dish he’s very famous for, which was more simply named Psychedelic Veal. For that dish, Bottura served the meat with a splattering of colorful beet and herb sauces. 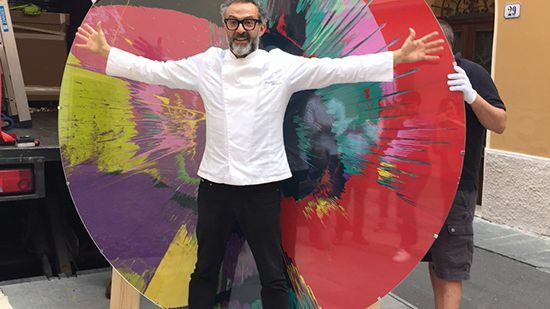 “We use color like Damien Hirst in his spin paintings,” Bottura proclaimed. And so now Bottura’s dish has a new name. And his restaurant has a new painting. Me personally, I’m figuring out a way to do something that will inspire Hirst to send me a painting. I’m open to suggestions.